My 95 year old grandfather passed away over the weekend. I can’t say it was unexpected – his quality of life deteriorated significantly this last year or so, but these last weeks it all became much worse and much harder on him. His mind was sharp, but his body was starting to give out on him. Which, of course, bodies do when they’ve been on this earth for 95 years. Tuesday he told my uncle he was “done”, and by Saturday morning my dad was rushing in to spend time with him in his last moments. I’m told he hadn’t moved from the couch in several days and kept his eyes closed and was not engaging in conversation. I’ve cried a fair bit, I admit. Despite knowing it was coming, and being “okay” with it (meaning that it was for the best that his suffering and pain ended), it’s still hard to not cry when I think of him. We have a photo ornament of my grandfather holding the baby when he was 2 weeks old. We’ve been working with the kiddo to point to me when we say “mama” and to the husband for “dada” and to himself for “Declan.” He never points to himself. Except yesterday, he pointed to the ornament of grandpa holding him and did it. And I about lost it. My natural urge, when it comes to grief, is to bake and craft. I seek out those things that comfort me. Maybe there’s some symbolism there in the fact that life is varied and full of change and, generally, baking means the same results with the same recipe (and, similarly, the same knit stitch will produce the same stitch result). There’s a bit of meditation in the kitchen or behind the needles. It’s where I go when I need to think. To take some “me” time and reset. But there’s no time to grieve when you have a one year old under foot. They neither know or understand what is going on outside of their little bubble. They don’t care that mommy needs to be in the kitchen alone to bake and cry. Or to sit in a corner with some yarn and knit and think. Which makes this whole grief thing impossible. How do I take time to grieve when I’m catering to a toddler? How do I take care of myself and my own needs? I’m sneaking in knitting every chance I can get. 5 stitches here, 10 minutes there… whatever I can squeeze in to be that comfort I need right now. It’s not ideal, of course, but it kind of works. 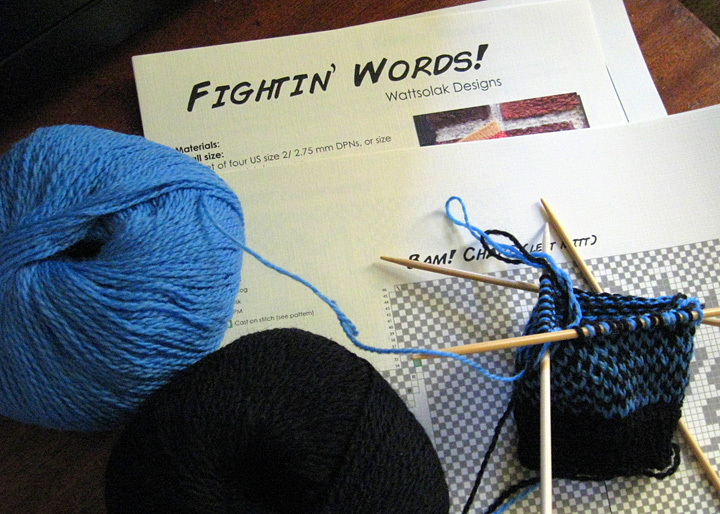 No, I’m not giving up knitting. You can pry my needles out of my cold, dead hands. I am, however, letting go of more yarn. 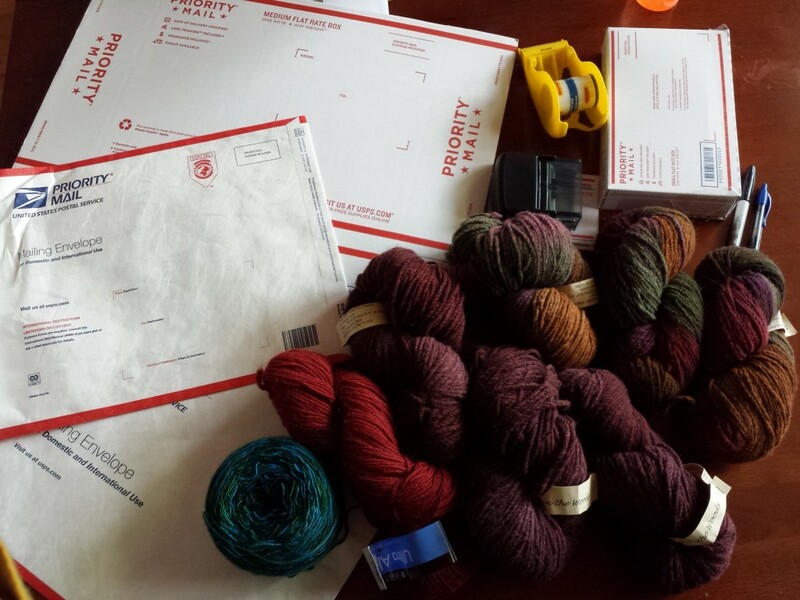 I did some soul searching, and also a bit of thought about my stash, what I like to knit, what I have time to knit, etc. I then posted yarn to my for sale or trade page on Ravelry and told some sweet online friends to have at it and pick whatever they wanted. Merry Early Giftmas! And, now, 10 skeins of yarn are moving on to other homes where they will be cherished and loved and, more importantly, knit into other things. My yarn drawers are looking better and better each month between the projects I’m working through and the yarns I’m sending on. Maybe, at this rate, I’ll eventually get to my dream of a zero stash after all? 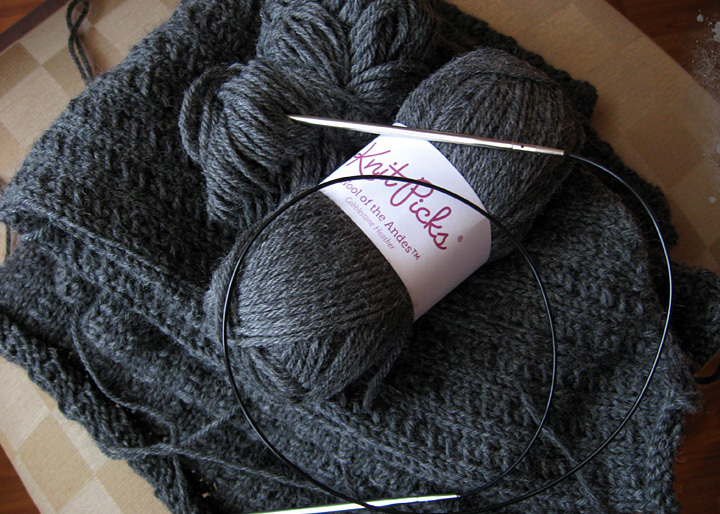 In other knitting news, next week I’ll be in a cabin in the woods with my knit group. I’m trying to plan what I’ll take with me though that’s quite difficult considering all I wish to accomplish. I tend to be an overachiever, after all, when it comes to the amount of projects I think I can get done. I will be knitting until my fingers bleed, but hopefully I can come home with a project or two finished and feeling like it was a good, productive weekend away. The plan at the moment is to take the Husband’s cardigan, to finish his holiday stocking, and to make the Little Mr a new hat since he’s outgrown the one I made him earlier this year (so much for that pattern being toddler sized… either that or my kid has a big noggin!) I may take my sock needles with me just in case – we’ve started dyeing yarn each year so worst case if I get too bored – or I finish projects quickly – I can throw my yarn in a bag in the dryer and then wind it up and knit it. 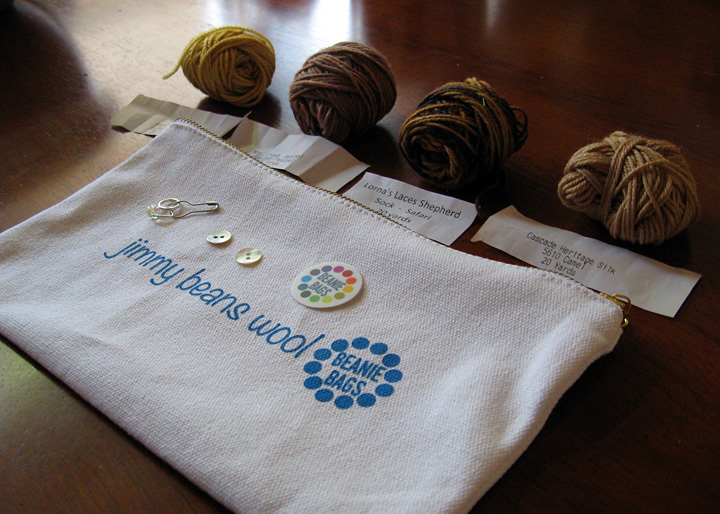 Last month I saw a post about Jimmy Beans Wool offering a subscription service for yarn. For $10, each month you receive samplings of different yarns. Since I’m no stranger to $10 shipments (I had Birchbox previously, but I’ve tired of the samples of cosmetics and canceled it), I was totally in! Today my shipment arrived (well, last night technically) so I thought I’d show off what I received. There’s 20 yards each of the following (from left to right): Baah La Jolla/Byzantine Gold; Mrs Crosby Satchel/Roasted Chestnut; Lorna’s Laces Shepherd Sock/Safari; Cascade Heritage Silk/5610 Camel. Plus there’s two buttons and a stitch marker. They also included a little printed card that has a wristlet pattern on the back of it, but since I’m not a knitted jewelry kind of person it’s not really something I’ll wear and therefore won’t make. I’m kind of ‘meh’ on the colors. They’re very fall-like, for sure. I might use the gold for a star ornament, and the chestnut for the trunk on some holiday trees. The safari and the camel… I will probably just swatch those to see how they knit unless some other pattern comes to mind. 1 holiday countdown/advent piece, though I’m undecided on what, exactly, it will be. Missing from this list is a lot of gifts for a lot of people. I can’t decide what to make for everyone on my list, and the niece and nephew will probably just want money. So I might make them an ornament and that’ll be my handmade contribution to their ornament boxes. Same with the stepson and his girlfriend. Also, I’m not sure that I really want to spend time making something for someone and it not be appreciated. So there’s that. Not everyone is knit worthy, I’ve learned, and my time is more precious these days. I also have a baby gift to knit, which hasn’t even been started yet. It’s not a sweater, at least, but I can’t ever do something easy like a knit ball. So I really should get on that, too.